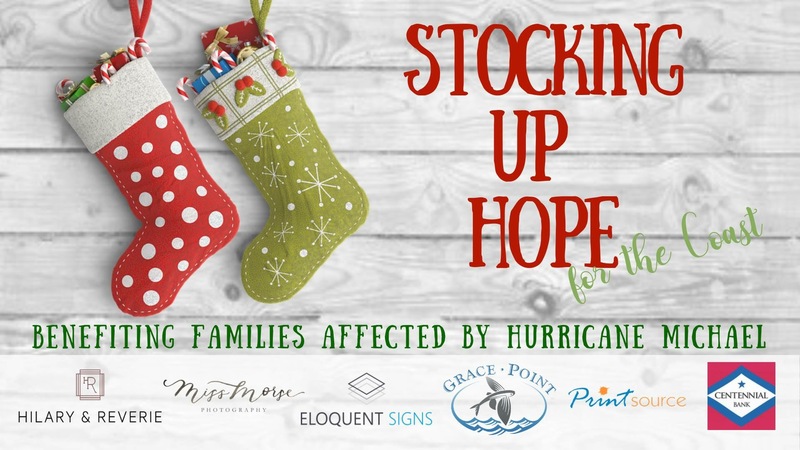 As we enter the holiday season, please join us in an effort to bring joy to families affected by Hurricane Michael on Christmas Day through our inaugural Stocking Up Hope Campaign. Stocking Up Hope is not just about helping families put presents under their tree – it is about the gift of hope and wishes fulfilled. So many of our neighbors to the East have dealt with unspeakable devastation and loss and have handled their reality with an incredible grace and humility that is truly touching. Our goal is to provide families the means to enjoy the Christmas morning that they deserve. 1. Fill out a sponsorship card online here. 2. Our goal is to fill 500 stockings with $250 in gift cards each. Gift cards and monetary donations accepted through December 20, 2018 and greatly appreciated. GoFundMe graciously provided a 0% platform fee allowing your monies to go directly to families at no cost! As thanks for their generosity, you have the option to leave a tip to help them improve and operate their services; however, if you do not wish to leave a tip, simple choose OTHER at checkout and select zero. PRO ELF TIP: Not able to run across town to buy gift cards? Give a cash donation securely via our GoFundMe account, and we will make sure the stockings are filled, signed and delivered! – Area restaurants: Chili’s, Panera, Starbucks, McDonalds, Olive Garden, etc. PRO ELF TIP: Have unused points on a credit card? You can use points to purchase gift cards! 4. Decorate stocking. Add Stocking stuffers of your choice: candy, gum, small items. Write out gift tag. Turn it back in. Hilary & Reverie is partnering with local churches and charities in Bay County to handle distribution to those in need and 100% of all donations will go directly to affected families. 5. Share the HOPE!! Please share Stocking Up Hope on Facebook, Instagram & Twitter, and if you have friends or family members who might like to contribute, please let them know how to participate by Stocking Up Hope. SPECIAL DELIVERY: Every Stocking Sponsor will be entered to win a 1-hour Family Portrait Session (a $350 value) and a $250 wall art/album credit from Miss Morse Photography. Who We Are: Hilary & Reverie is a full-service real estate brokerage located on 30A in Santa Rosa Beach, Florida. While our area was not directly hit, our neighbors and friends, just a few mile away have been, and we want to be a good neighbor and help take care of them. We plan to continue the assistance indefinitely so that these communities are able to come back stronger & better than before. Our local donation center is located between the HUB on 30A & Watersound Beach at 87 Grace Point Way, Watersound FL 32461. We are open daily from 10am – 5pm to receive donations.